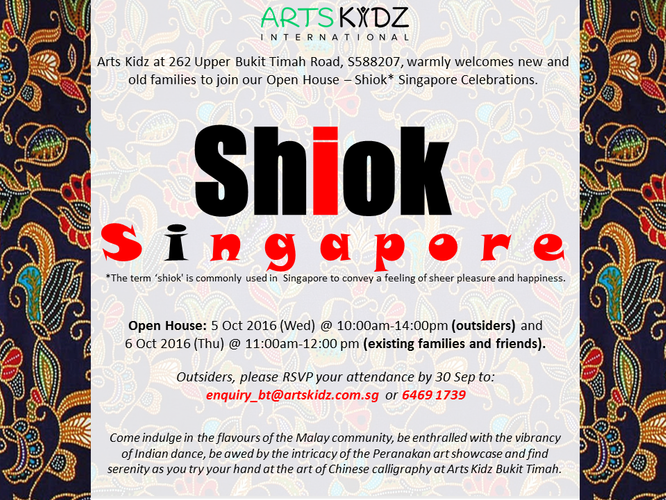 Arts Kidz at 262 Upper Bukit Timah Road, S588207, warmly welcomes new and old families to join our Open House – Shiok Singapore Celebrations. Open House: 5 Oct 2016 (Wed) at 10:00am-14:00pm (outsiders) and 6 Oct 2016 (Thu) at 11:00am-12:00 pm (existing families and friends). Outsiders, please RSVP your attendance by 30 Sep to: enquiry_bt@artskidz.com.sg or 6469 1739.